Harry Murray was born, raised and still lives on the North Fork of the Shenandoah River in the village of Edinburg, Virginia where he owns and has operated Murray's Fly Shop for over 40 years. Drawing from a lifetime of smallmouth bass fishing, guiding and teaching at his angling schools, he has developed his own approach to evaluating rivers and streams in order to find the best places to fish. Harry can discuss in great depth the various minnows found in smallmouth rivers, the flies that match them and the most productive techniques for fishing them. Harry Murray has been fly fishing, guiding and teaching others about smallmouth bass most of his life. You'll find his practical approach to finding and hooking up with these exciting fish an enlightening experience. Listen in and learn his secrets. 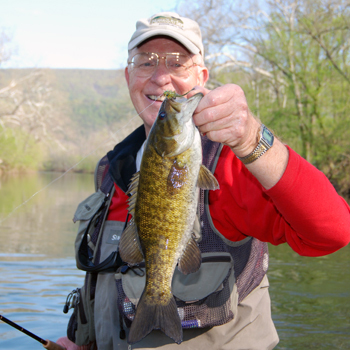 The smallmouth nymphing game is one of Harry's favorite techniques and it shows when he takes you on the river and helps you discover the types of water and methods that work best. He also loves taking smallmouth on dry flies and surface bugs. Harry has published eight books on fly fishing and has also made two videos and two DVDs. His articles can be seen regularly in many national fly fishing magazines. Harry conducts "on the stream" fly fishing schools each spring and summer out of his fly shop for trout and smallmouth bass. In the winter he conducts classes on fly fishing and fly tying in Murray's Fly Shop. He has designed over 50 fly patterns for both trout and bass and provides guide service for both, in the Virginia area. To learn more about Harry's fly shop and the classes available visit Murrays Fly Shop.